Ten years after his first all-blues album, From the Cradle, Eric Clapton released Me and Mr. Johnson, an album-length tribute to his hero, the legendary bluesman Robert Johnson. Not that this is the first time Clapton has paid tribute to Johnson. Throughout his career, Clapton has not only drawn on Johnson for inspiration, but he has covered his songs at pivotal moments : "Ramblin' on My Mind" on his classic album with John Mayall, Bluesbreakers; "Four Until Late" on the first Cream album; and, most memorably, the rampaging cover of "Crossroads" on Wheels of Fire that became his anthem and arguably his defining moment. Considering this long history, perhaps a full-length tribute was inevitable, yet Me and Mr. Johnson still is welcome, in part because it's been a long time since this guitarist has sounded so comfortable and relaxed, as if he was having fun making music. With the possible exception of the spotty yet charming B.B. King duet album Riding With the King, this is simply the most enjoyable record he's made since From the Cradle, and in some respects it's a better blues album than that since it never sounds as doggedly serious as that guitar-heavy affair. 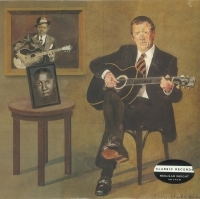 Given the somber, sometimes chilling lyrics Johnson wrote Clapton admits that "At first (his music) scared me in its intensity", an accurate summary of the haunting nature of those 29 sides the bluesman cut in the '30s it's a little ironic that this tribute winds up being fun, not somber, but the light touch makes for a better album. That lightness comes from the deep love Clapton holds for this music, since the enthusiasm and enjoyment he and his band all the old regulars like Andy Fairweather-Low plus Billy Preston on keyboards give the performance results in the album's light, infectious feel. While that does result in versions of "If I Had Possession Over Judgement Day" and "Hell Hound on My Trail" that sound anything but haunted, they do sound nicely next to the up-tempo rave-ups of "They're Red Hot", "Last Fair Deal Gone Down", and "Stop Breaking Down Blues" since all of them sound like Clapton is having a hell of a good time. Some might take issue with this, and others may find the album too slickly produced admittedly, blues albums should never boast a credit for Pro Tools, as this does but this is a heartfelt tribute that's among Clapton's most purely enjoyable albums.